Before 2004, searching for a job online was confusing and slow, you had to go to specific job boards who would only advertise for specific roles with specific companies. It wasn’t as open and accessible as it is today. There wasn’t any online job search platform that collated all the jobs you could find online in one place or anything out there that understood your preferences as a job seeker. Not until Indeed came along. Indeed revolutionized the online job search industry by becoming the first aggregated search engine for any and every job you can find online and has quickly become the world’s number one platform for employment and continues to play a big part in matching the perfect employer with the perfect candidate. Indeed is an employer’s dream because of the sheer size of its reach, with over 100 million CVs and 200 million people visiting the employment website every month. Indeed truly gives you access to the most talent in every single field of work. With over 200 million monthly job seekers from over 60 countries, Indeed offers employers the most comprehensive and diverse talent pool of job seekers. 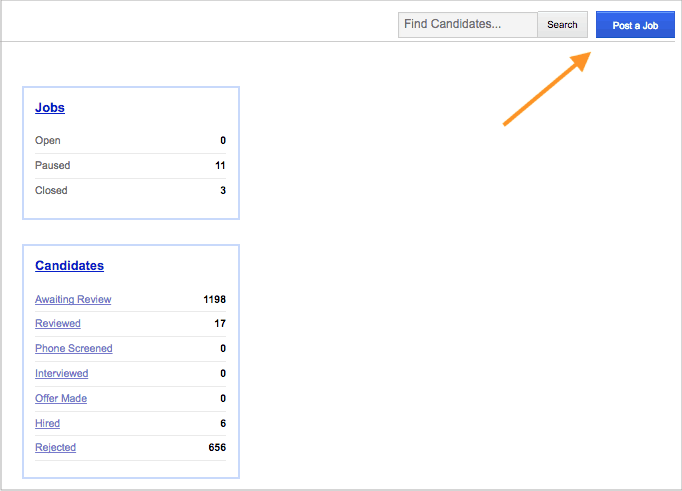 For those employers looking to be cost-effective in their search for candidates, you can post a job for free on Indeed. All you need to do is create an employer account using your company email and job information. Step 1: Once you have created your free employer account, you’ll find the ‘Post a Job’ button in the upper right-hand corner. Step 2: This will take you to the ‘Getting Started’ page where you are required to include the Job Title, Company, and Location. Once done click the ‘Continue’ button, and this will take you to the ‘Job Details’ page. 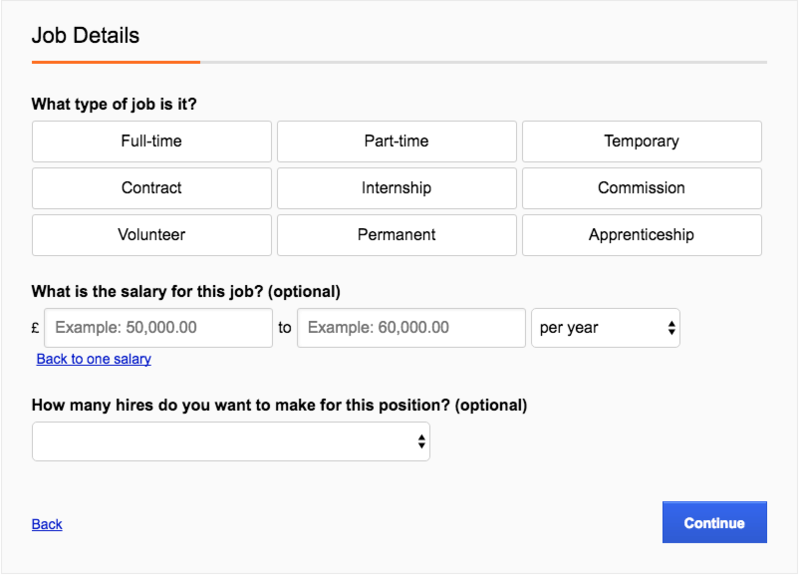 Step 3: This page allows you to choose what type of job is being offered, the salary and how many hires you want to make for the position. Once done click the ‘Continue’ button, and this will take you to the ‘Job Description’ page. 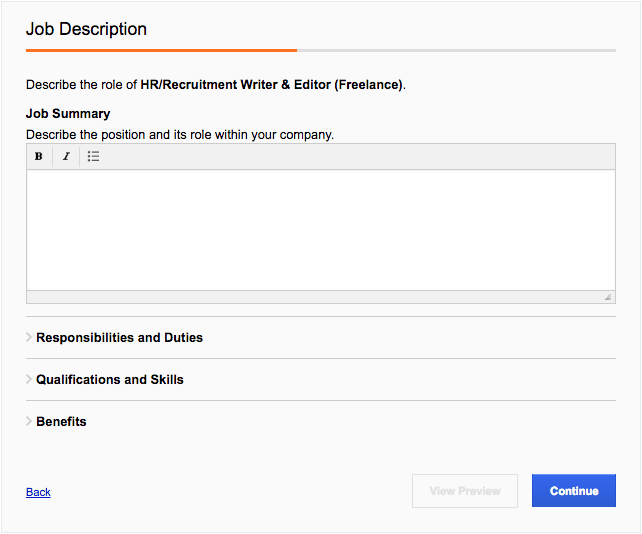 Step 4: This section allows you to describe the specificities of the position; what kind of role within the company the candidate will be undertaking, their responsibilities and duties, what qualifications and skills they are required to have and what kind of added benefits will come along with the role. Once done click the ‘Continue’ button, and this will take you to the ‘Application Settings’ page. 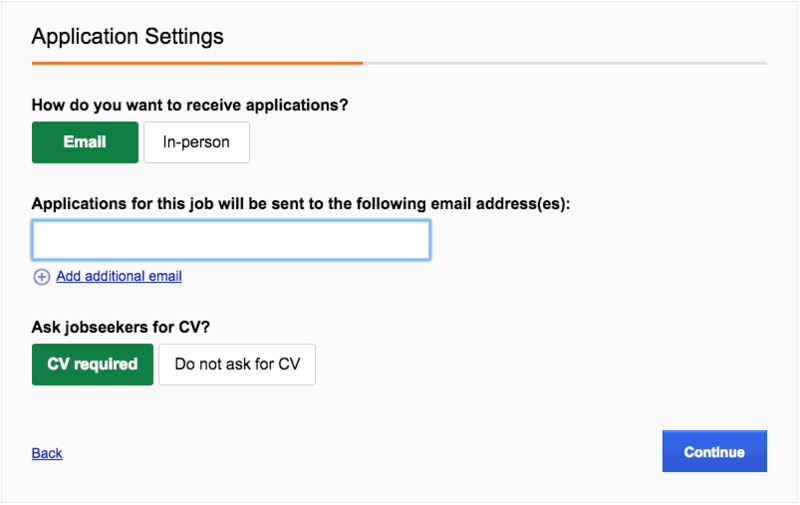 Step 5: Here you can specify how you want to receive applications, what email address you want applications sent to and whether or not a CV is required. Once done click the ‘Continue’ button, and this will take you to the ‘Qualification Questions’ page. Step 6: This your last page, where you can specify what type question you want to ask candidates such as experience, education, location, and language. You can also specify if these aspects are required or preferred. Once done, you will be able to review all of the job specs and make any necessary changes. 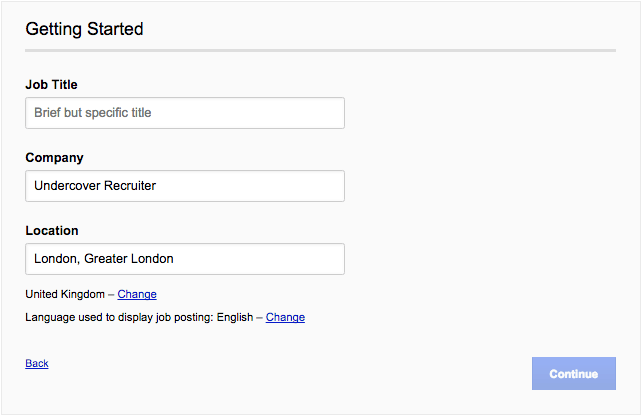 Once ready, click the ‘Confirm’ button and voilà your job ad will be up on Indeed! Indeed offer great sponsored options for employers looking to go farther and wider in their search for the perfect candidate. The benefit of using their sponsored service is that your job will stay prominent and highly visible in relevant right at the top of search results, which very much increases your chances of hiring your next employee. For new users on Indeed, you can claim a $50 credit (or $50 credit for UK-based users) to sponsor your next job posting! As highlighted below, you will be able to find sponsorship option next to the job you have created. This will take you to ‘Sponsor Job’ window where you can set the daily average spend of your sponsorship, which will be based on cost-per-click. Based on your preferred daily spend, you will see the estimated amount applications you will get in the next month. You will also be able to decide the duration of your sponsorship. Once you’re happy with your choices, your job will be officially sponsored! 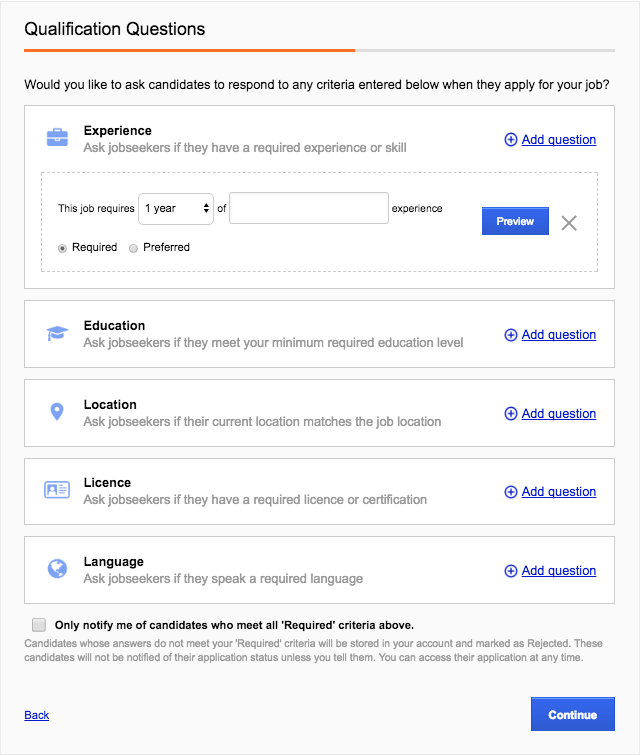 With Indeed being the go-to place for most job seekers, having the ability to showcase your culture and be transparent about your company can go along way for candidates who want to get to know your business a little more! Almost 90% of job seekers use mobile in their job search and Indeed is designed to be used on-the-go, on whatever mobile device you decide to use whether it be a smartphone or a tablet. Indeed even offers dedicated mobile apps for IOS and Android devices. With Google announcing their entry into the recruitment space in May 2017, Indeed will have major competition moving forward with Google planning to include potential jobs within the organic results of it’s Google’s search engine. Google will be the first point of contact for most job seekers purely based on the search engines current use and popularity, and thus see Indeed lose a lot of traffic. On the other hand, yes Google might have a more sophisticated search engine than Indeed, but Indeed does much more than just search results and job alerts. Indeed offer a full suite of employment tools and they have proven themselves to be the place to get jobs and find the best candidates. Due to the heavy traffic on Indeed, with thousands of job’s being listed on the job search platform on a daily basis, free job posts get lost very easily. You will only reap the benefits from the platform through the paid sponsorship plan to see any sort of results. For small businesses or startups this can be an issue due to their limited funds, but with Indeed being the go-to place for job seekers, it is an investment we recommend making. 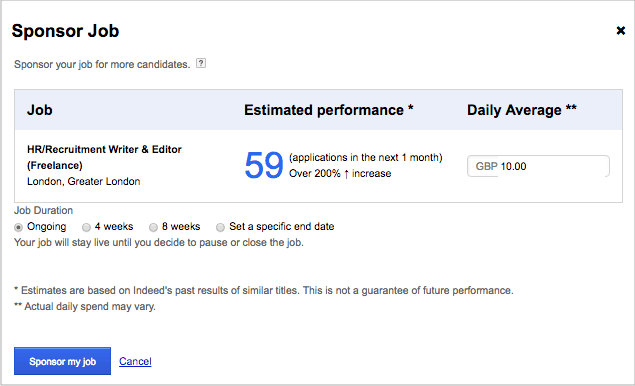 Indeed’s sponsored job posting is based on pay-per-click, which is generally found to be between $0.25 to $1.50. This pricing system makes sense as an employer as you only get charged based on the genuine interest of a candidate. So for businesses operating on a small budget, this is a great way to advertise a role without being charged an arm and a leg. Indeed is the world’s largest job board, and offer great tools for businesses of all sizes. The platform is not only a place to find ideal candidates but a place to elevate your employer brand; allowing candidates to see into your company and assess their fit with you. While Indeed does offer a number of free benefits, you will not see the true benefits of the platform without going for the sponsored option. 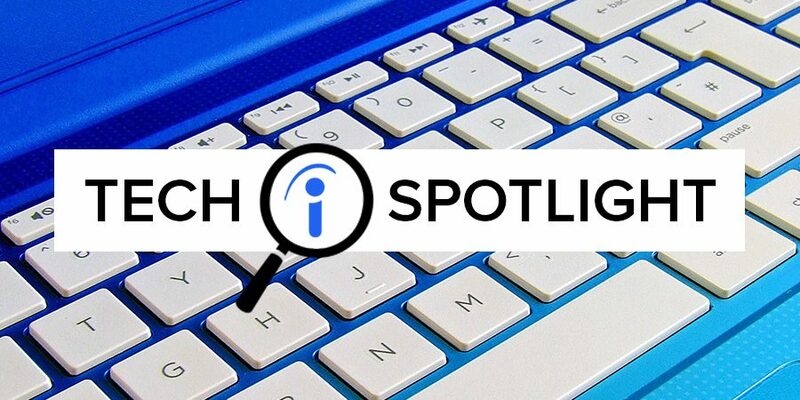 This Tech Spotlight is sponsored by Indeed, but all Tech Spotlights are reviewed using an unbiased framework. Would you like your HR tech product reviewed by the Undercover Recruiter team? Check out our options today.